There are a few basic techniques I think are worth knowing how to do, such as scrambling eggs, cooking rice, and making a versatile salad dressing among other things. In that category, I also include poaching chicken (if you eat chicken obviously.) I thought this was a good time to do a refresher on this technique since back to school has made many of us desperate for make-ahead meal tips and fodder for school lunches. Enter poached chicken. 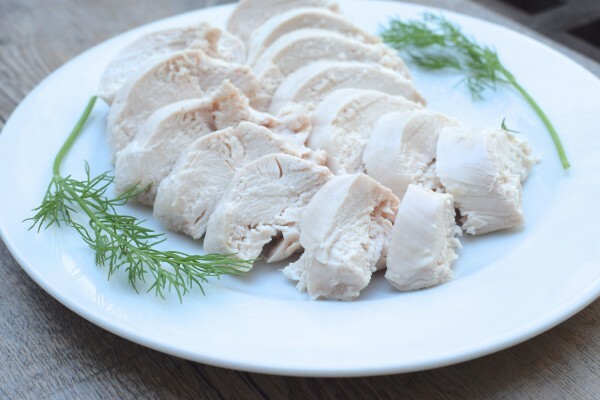 Poached chicken is very easy to do and provides limitless options for meal planning. It is delicious in chicken salad, with mixed greens or grains and a vinaigrette, in enchiladas or quesadillas, in a sandwich or wrap, and so on. 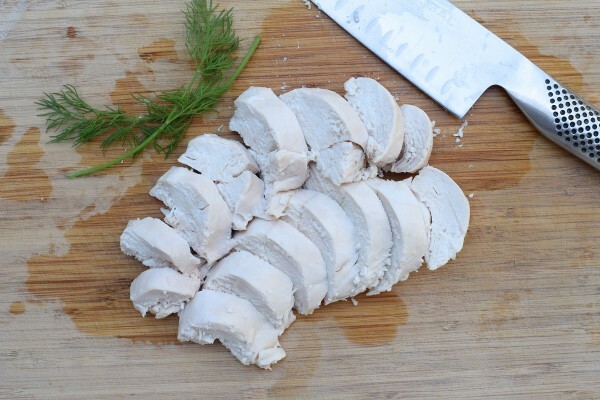 Poaching is probably the cleanest way to cook chicken, since we avoid the formation of carcinogenic compounds that are created when we grill and sear, or cook animal protein for long periods of time at high temps. Read this article if you would like to learn more. So if you’re going to eat animal protein, steaming, poaching and low temps are the most healthful ways to go. If it’s so much better to poach and steam chicken, why don’t we do it all the time? Because unfortunately, it’s not as flavorful as searing and roasting. All those crispy brown bits, albeit carcinogenic, are tasty. So once in a while, it’s a good idea to change it up a bit. And if you’re looking for cooked chicken to add to meals, try poaching. We’ll add some extra flavor by including onion, garlic, salt and pepper to the poaching liquid though. Poach some chicken on a Sunday and have it for a couple of days’ worth of lunches and dinners during the week. 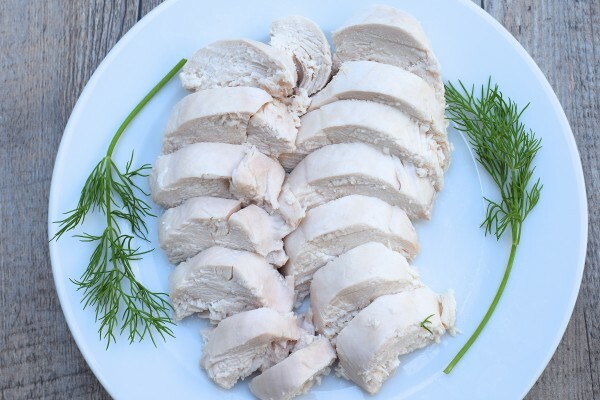 You can also freeze poached chicken, wrap it well in aluminum foil or plastic wrap and use it within 3 months. This week I will also share one of my favorite salads using poached chicken. Stay tuned! 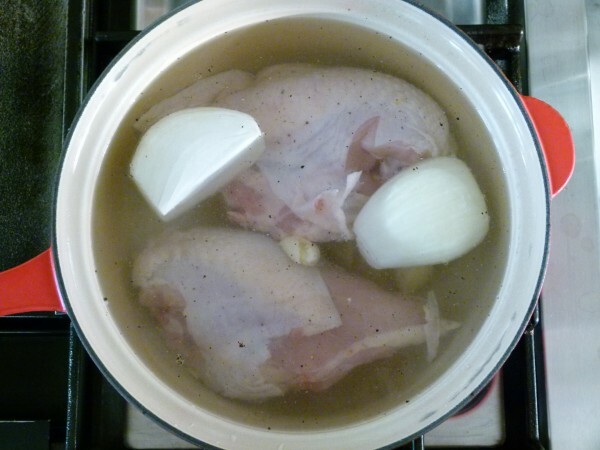 Place the chicken in a saucepan with the onion, garlic, salt and peppercorns and add water to cover. Bring to a boil over high heat, reduce heat to low, cover and simmer until the chicken is just cooked through, about 25 minutes. Allow chicken to cool in the poaching liquid. Remove the skin and bones and slice, shred or cube the meat to use as desired. You can place the bones back in the poaching liquid with some fresh chicken parts and some carrots and celery and simmer very gently to make a stock. 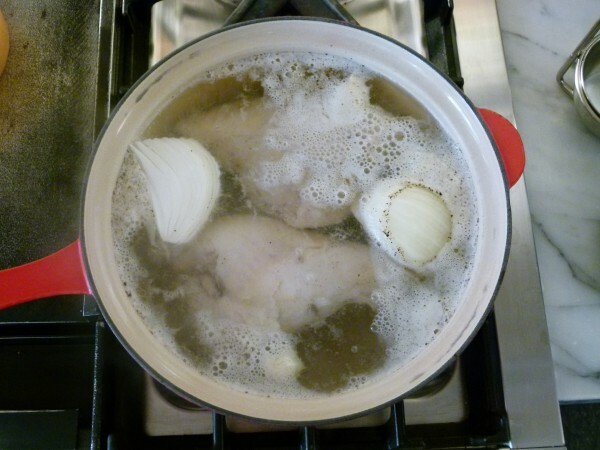 Click here for how to make chicken stock. can you poach the chicken in some broth for extra flavor? 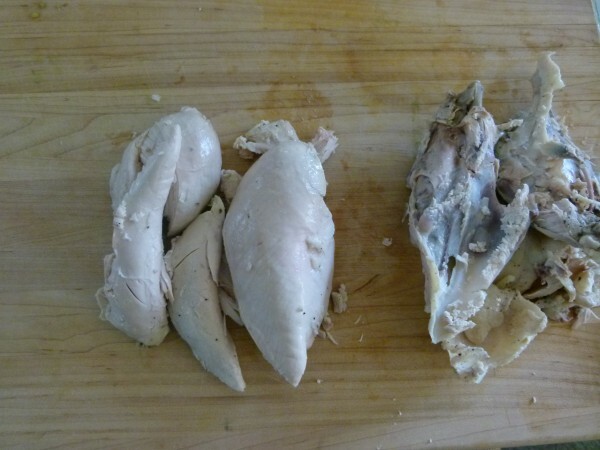 This may be a silly questions but would it be okay to use chicken breasts without the skin or bones? Not a silly question! I do think bone-in, skin-on has more flavor and stays a bit more moist, but if you already have boneless, skinless, feel free to use them. Only cook for 15 minutes and then allow to cool in the poaching liquid.